The PEG-N710C is the latest in the Clié line of handhelds from Sony. It offers the first ever 320 by 320 pixel screen in a Palm device. It also has a MemoryStick slot and a jog dial. Sony is positioning it as a multimedia device and it comes with audio and video applications and a set of headphones. The N710C comes in a silver housing with chrome trim. It is 2.88 x 4.75 x 0.69 inches and weighs 5.7 ounces. It runs the fastest processor available for the Palm platform, the 33MHz Dragonball VZ, has 8MB of RAM, and 4MB of flash ROM. I'm not going to comment on the appearance of the N710C, partially because that's so subjective and partially because I don't have any strong feelings one way or the other. There are pictures of it everywhere; judge for yourself. On the front, the silver buttons are surrounded by a chrome rectangle and its up/down buttons are combined into a single rocker switch. The power button is at the bottom and has a small LED in it to indicate that it is on. This is necessary because when listening to music it is possible to turn the screen off. On the left side, from top to bottom, are the headphone jack, the Jog Dial, the Back button, and the Hold Switch. Obviously, this is most convenient for right handed people, who tend to hold the device in their left hands. I tried to see what using the Jog Dial would be like for someone who held it in their right hand. This required me to use the Jog Dial with my index finger. There's no doubt about it, this was awkward. I could move up and down easily but when I tried to push down the Jog Dial to select something, I tended to also pull down on it so I ended up opening the next item on the list. On the top is where the flip cover attaches, the Infrared port, the Memory Stick slot, and, on the far right, the stylus slot. My only complaint with the MemStick slot is that the MemStick itself protrudes about an eighth of an inch from the slot. This gives you room to push it down, which is required to remove it. But as it is, if the flip cover is removed, the MemStick protrudes above the top of the handheld. This is going to cause problems for cases that need to grip the handheld tightly, as they will tend to push down on the MemStick. Take a look at my review of the Rhinoskin Slider case for an example. On the bottom is the serial port. This isn't protected by a door or anything. This makes me nervous but most handhelds don't have covers for their serial ports either and I haven't heard any reports of this causing serious problems. On either side are two slots for holding clip-on peripherals. There is another slot in the middle of the back to give clip-ons some extra security. The reset button is also there. The stylus is fairly standard, with a metal shaft and a plastic tip and topper. The top unscrews to reveal a reset pin. As mentioned earlier, the flip cover attaches to the top. It's dark blue, has "Clié" written on it in silver, and it is hinged so that it can fold around all the way to the back. I understand the Japanese version has small magnets built in to hold it closed. The U.S. version doesn't have these but I don't miss them. As it is, I can open the cover one handed, flipping it around like Kirk opening his communicator. In a nice touch, the cover is shaped so that pushing down on it won't push the buttons on the front of the handheld. However, it seems to be lightly attached. Over the life of the device, the flimsy plastic tabs that hold it on could easily wear out. The cradle is silver plastic with a touch of chrome and matches the handheld nicely. It has one outstanding feature. The power adapter can plug into either the cradle or directly into the N710C. This means that no additional travel charger is necessary. The wall socket plugs even fold down to make a smaller package. As the N710C is the first Palm-based handheld to offer audio playback, it needs some decent equipment for listening to it with. It comes with a pair of clip-on earphones that attach to your ears rather than clamp onto your head. These save on space but they cut off the blood supply to my ears after a while. If you don't like these, any standard headphones should work. It also has a small control wand that lets you use the MP3 player with the handheld still in your pocket. In another nice touch, the wand has a small nub on it to let you use it as a stylus without scratching the screen. As much hoopla as the N710C's MP3 player has gotten, its best feature is its screen. It is simply the best one ever in a Palm-based handheld and possibly the best in any handheld, period. It is definitely brighter, and whiter, than the m505's screen. It can display images at near photo quality. In fact, if you divide the N710C's resolution by its screen size, you see that it is over 150 dots per inch, which is pretty darn good in my book. If one of the primary uses for your handheld is as a photo album, there is no question that this is the handheld for you. The included image viewer, Picture Gear Pocket, fully supports the screen and can show images from RAM or the Memory Stick. But like everything in life, the screen isn't perfect. Don't let anyone tell you it doesn't have a grid. I can't really call it a black grid because it is more of a light, light gray, but if you look at any area of white you can see the individual pixels outlined in gray. Also, it is a bit weak in displaying red. Instead of strong reds, they end up being a touch washed out, at least on my unit. According to my fiancée, the artist, its lacks chroma. I have no idea what this means but it might mean something to you. I've also read comments from people saying that they are getting an N710C because the m505 requires you to have the backlight on all the time. Well, the N710C requires it, too, in anything short of direct sunlight. Speaking of which, the N710C is perfectly viewable outside, though that's not where it looks best. It takes on a slightly brown tinge. The N710C has one feature that they really should have put in the m505: a brightness control. Tap a small icon in one corner of the silkscreen area and a slider control appears. This lets you turn the screen up to full brightness or turn it way down to save power. Even on the lowest setting it is quite readable. Remember a few weeks ago when Palm released an app for the m505 that let the sidelight remember whether it was on or off when the device was last turned off? The N710C does that by default. The N710C has a pixel-doubling feature built in to let any application run on its hi-res screen and I didn't run into any that didn't run fine on it. The only drawback to the screen is there aren't a lot of third-party apps out that make real use of it. I see a lot of potential for hi-res games but, of course, the N710C would be the only handheld they could be played on. Maybe as the installed base grows and the N610C comes on the market, we'll see more 320 by 320 resolution apps. There are over 7,000 developers signed up to make Clié-related products. Currently, the screen is just 8-bit color. But I have absolute confirmation from a Sony representative that the only thing holding it back from being 16-bit is the fact that it is running OS 3.5. Once the upgrade to OS 4.0 is available, the N710C will be able to display 65,000 colors. I'm not too fond of the plastic covering over the screen because I just don't like the way it feels to write on. I fixed this really quickly by putting a piece of clear scotch tape over the Graffiti area, which gives it a better texture and protects it from scratches. This handheld does more than just pixel-double third-party applications. It has a feature called High Resolution Assist that replaces the low-res fonts in most applications with a special hi-res one. This lets all applications take advantage of the N710C's excellent screen, not just specially written ones. Whoever came up with this at Sony deserves a bonus. Let's face it, most companies aren't going to create a special version of their app just for one company. This works with most applications I tried and even AvantGo. I ran into a few apps that had problems but individual apps can be marked to not have their fonts changed. The next step Sony needs to take with this is to let the user choose from a list of hi-res fonts. Frankly, I'm not fond of the font Sony chose. I understand there are some companies working on this already. I've already mentioned it so I'll go ahead and cover the N710C's MP3 playback abilities. This function is unique among Palm handhelds and comes because it has a special Digital Signaling Processor (DSP). The Motorola chip that handles the OS and the rest of the handheld's functions isn't powerful enough to do MP3 decoding. The only downside to having the separate DSP is it uses a lot of power. There is no doubt that a few hours of MP3s makes a major hit to the batteries. Still, Sony has done all they can to minimize this. The Hold switch on the left side turns off the screen but still leaves the device on and capable of playing music when controlled by the wand. The AudioPlayer app does everything you would expect it to do. It pulls files directly off the Memory Stick, displays them in a list, and lets you play, fast forward, and reverse through them. The audio goes only to the headphones because the un-amplified speaker isn't capable of much more than beeps. The N710C comes with the gMovie Player preinstalled. I suppose the word I'm looking for here is "adequate" but I was a bit disappointed. Movies aren't in hi-res and are choppy. Sound quality is good though. The control wand works with this app as well. I suppose this is forced on them by the need to conserve memory space. A 32.5 second, 160 x 120 movie with audio is 1.2 MB. With that as a guide, a 90 minute movie would be roughly 200 MB. Though as it stands now, they could save space by leaving the last half of the movie off because I don't think I'd sit through the whole thing unless they could improve the picture quality. I've heard there are a third party developers working on improved replacements for this app. I hope so but I'm not going to talk about them here as I'm just going to cover what comes in the box. The Memory Stick is Sony's baby so it is no surprise that the N710C has a slot for it. In yet another move that I think other device manufacturers should copy, an 8 MB one actually comes with the handheld. And even better, it's preloaded with some movie files, an MP3, some third-party apps, and a bunch of pictures for the image viewer. The handheld comes with an application called MSGate that lets you access the contents of both RAM and the MemStick, including copying, moving, and deleting files. But be careful, rather than letting you choose which folders to look in, applications expect their files to be in predetermined folders on the MemStick and can't find them if they are anywhere else. Sony has added a totally awesome feature to the desktop application. If your handheld is in its cradle and you go into the AudioPlayer and use the Transfer function, your MemStick will be added to the Windows Explorer as a removable drive so you copy anything you want back and forth, not just MP3s. This would be even better if it were part of the OS. Palm, are you listening? I tried to get an update from my contact at Sony on the progress of the other types of MemStick peripherals, like the Bluetooth module or the digital camera that the company is supposed to be working on. Unfortunately, the company absolutely will not discuss unannounced products, at least not with the likes of me. All I could get was that they are on track to release some MemStick peripherals this year and some next year. I couldn't even find out which ones. Rank speculation on my part tells me that the first is likely to be the Bluetooth module. Palm is planning to release a Bluetooth SD card by the end of the year and Sony will surely want to not look like its falling behind. This is another Sony feature that I hope eventually becomes standard on all handhelds. It is just so darn convenient. You can move through the OS and the built-in apps with just your thumb, saving a lot of time. Heck, I can look up a phone number without ever pulling out the stylus, which is handy and saves wear and tear on the screen. If you already have a N710C and you haven't installed the OS upgrade patch that came out a few weeks ago, you should go do it now. It greatly improves the Jog Dial and side button. With it, the back button can be used as an on/off switch. If you like to use your handheld one handed all the time, the N710C has some great features to help. Say you are in the Address Book. Hold down the Back button for a second. The Category drop-down box will be highlighted and you can use the Jog Dial to scroll through it. Hold it down longer and the first Menu will drop down so you can scroll through it. You can even add additional functions to the menu, like Power Off or Find. I'm certain that a good number of the comments posted about this review won't have anything to do with it. Instead, I expect another skirmish in the ongoing civil war between Palm and Sony fans. I spoke with some of Sony's management team about their relationship with Palm and even asked them if their goal was to drive Palm out of the hardware business. Ty Takayanagi, who is the Product Manager of the Handheld Marketing Group at Sony Electronics, told me, "Currently, the handheld market is an exciting place for development and innovation. Sony embraces the industry's competitive nature, as it forces us to come up with ideas and features that go beyond the ordinary. We are committed to work with Palm and their operating system to bring new and entertaining applications to a platform that is known for its ease-of-use." Yes, that's in Marketingspeak but it does say that Sony is committed to working with Palm. Doesn't sound like a company trying to crush the competition, does it? I'm not trying to add ammunition to the fight but I don't think I can do a review of the N710C without doing a comparison with its chief competitor, the m505. Part of the reason I think the arguments between the two camps have been so endless is the two handhelds are designed for two different target markets. If you are in one those, the handheld designed with your needs in mind seems so obviously superior to its competitor that it can be difficult to understand why someone would prefer the other. If you aren't in one of those target markets, you might feel caught in the middle, unable to decide which is best for you. The m505 is a business Palm and comes with the features business users need. It comes bundled with Documents to Go to allow users to move their business-related files onto their handhelds and its vibrating alarm is perfect for people who have a lot of meetings. Its expansion slot is there to let them store large amounts of company data. Everything a business user doesn't need has been left off. The N710C is a multimedia handheld. It has the DSP so it can play music and a great screen so it can show high quality video. It is perfect for people who use their Palm as an entertainment device and, to me anyway, seems best suited for college students, twenty-somethings, and those still young at heart. While Sony didn't ignore business users, this device wasn't made with them in mind. I'm not saying that a doctor wouldn't be happy with the N710C's hi-res screen or a high-school student doesn't need the silent alarm, I'm just trying to explain how the two companies picked the feature sets they included in their handhelds. The ability to play MP3s isn't a bonus if you don't want your handheld to play MP3s. In that case, it's actually a negative because it drives up the cost with no benefit. If I had to put the strengths of the two devices into a nutshell, I'd say the N710C wins hands down in screen quality and comes out slightly ahead in form. The jog dial is a nice addition, too. The digital playback will be a deciding factor for many. The m505 has a better battery life and the silent, vibrating alarm is quite handy. The N710C isn't as wide as the m505, but is a bit taller and thicker. In my opinion, the fact that it isn't as wide makes it fit in my hand better than my m505 does. There are more add-ons available for the m505. This is an advantage that many overlook. I've posted lots of articles lately on new peripherals coming soon for the m500 series and on almost all of them, someone posts a comment asking, "When will this be available for the N710C?" When I talk to the companies, the answer is usually, "We might develop a version for the Clié is six months or so." They are still waiting for this handheld to prove itself. Let's face it, the first generation Clié models didn't exactly take the U.S. market by storm. Hopefully, some sales figures will appear that will show that the N710C is doing well and more companies will begin developing accessories for it. While I've tried hard to be even-handed about the N710C, I have to say that it is an awesome handheld that I can't imagine anyone who buys one being unhappy with it. It's not cheap at $500 but provides plenty of bang for the buck. Someone has posted this Egghead.com link in one of the Clie boards, selling for $420. There are still several stores which sells under $420. A nice upgrade to your Clie would be a 128mb memory stick for $142. Try finding a SD or MMC card for that price. That's a good price. It works out to be a $1.10 per MB. The best price I could find on a MMC card was $1.11 per MB and the best SD card was $1.25 per MB. The largest SD or MMC card I could find was 64 MB. Memory prices are very competitive so I'm sure that size will increase and cost will decrease. I don't mind paying an extra 7 cents a meg for a MMC since it isn't proprietary like the MemoryStick. As for price, I would compare the SD card with the MagicGate version. Let's see sd card's run at 12.5mb per second and sonysticks run at 2.45. Well I think I am going to buy a m505 forget the sony!! -> Let's see sd card's run at 12.5mb per second and sonysticks run at 2.45. Well I think I am going to buy a m505 forget the sony!! Well, SD cards run at that speed but do you know how fast the m50x reads/writes them??? You'll be surprised! "Device manufacturers are also supporting this flash-memory format. In Japan, Sharp is shipping an MP3 player that uses Memory Sticks, and car-audio maker Alpine is shipping in-dash players with a Memory Stick slot. Epson has printers on the market in the Untied States that support the Memory Stick, allowing consumers to save documents onto a Stick and print them by simply placing the Stick in a slot on a printer." The main difference between the MS and the MG is that the MG can hold ATRAC3 files -- and you are comparing an MG to an SD????!! Duh! As you wound say -- don't compare apples to oranges! >> "...Alpine is shipping in-dash players with a Memory Stick slot..."
An alpine with a memory stick slot? That rocks!! Go Alpine! Go Sony! Woohoo! Anyone have anymore info on the alpine unit??? I run a cva-1005 in my car and would love to be able to play my MP3's without having to run the pc in the trunk. I don't like spending $142 on something the size of a stick of gum. I agree - I suppose people would also pay $1000 for a 1Gb MS, too - I just couldn't bring myself to spend that much for something so small. Are the main advantages of devices using the Palm OS that the Windows CE operating system is unreliable and the battery life is poor? I've been hearing that applications designed for real power users, eg, doctors wanting large clinical libraries close at hand, will primarily be developed for the Windows CE operating system. I don't know if you've seen, but there's a huge base of medical apps for PalmOS. Palmgear even has 3 "Medical" categories. It's too late, the applications to let Doctors keep huge databases of clinical information in their handhelds have already been written... for the Palm Here's some of the apps available from ePocrates. qRx is the world's leading clinical handheld application providing over 250,000 health care professionals with point-of-care information every day. qRx gives you everything from indication-specific dosing to drug interactions to packaging and pricing info. qID is a custom-built infectious disease application designed specifically for Palm OS handheld devices. Fast and comprehensive, qID helps you find antimicrobial recommendations in a concise and clinically relevant format -- at the point of care. I am aware of many of the medical apps available for the Palm OS devices, but when companies try and put them all together in an easily used suite of products, it seems a bit daunting. We need easy wireless connectivity for wireless prescribing, normal web browsing for sites that are not optimized for web-clipping, and lots of easily accessed storage for clinical libraries that can be read with high resolution screens. The Handera 330 seems to about the only Palm OS device that might be capable of doing all of this fairly easily, but people who follow all of the new medical apps in development are telling me that everything is being demoed on Pocket PCs. Appreciate all of your comments. My wife is a Dr. at a major reserch hospital in the Pacific Northwest. Palm OS is definitely the platform of choice there, outnumbering WinCE 20 to 1. The killer app that drives everyone to Palm is Epocrates' qRX and qID. Also, the general feeling is that Palms are the easiest handhelds to use. The majority of Dr.'s aren't very techie and wan't something that is very easy to use and maintain. It has tons of info, including a buyer adviser. Where I used to work some of the monitored beds were outfitted with wireless connections so that Docs with palm VII could have instant access to their patients vitals. I think it was trial and Im not sure how it is working out. But it is a great idea. The back button can be user programmed to turn the Clie on and off which is a nice feature. The cradle cable power supply can be plugged directly into the serial port, thus becoming a nice travel charger. You can use a program called PowerRUN to launch many applications residing in the memory stick, thus saving precious internal memory. The screen scratches easily. Buy a screen protector from someone like Brando HK. A nice replacement to the default launcher is called Crs Launcher, which is hires and freeware. The case scratches easily and the front cover is poorly attached to the case. Buy a leather case/cover. With all the added features, this PDA is one of the most complex to set up and run to utilize all its potential. Otherwise, I think that it is the best Palm PDA currently out there, at least until the N610c comes out. I got to add that dust particles can get into the inside of the screen. It bugs the hell out of me and I don't know what to do to get it out. Anyone got a idea of how to clean it or hot to prevent more dust particles to get in. to seal dust go here...it will void warranty though and takes a bit of know-how. One thing you didn't go into was the speed of the devices, which is one thing I really disliked about the 710. Having a 505 and wondering if I should upgrade, the first thing I noticed is switching between the built-in apps is much slower on the 710. You might say you could but Afterburner on it to make it faster, but doing the same to the 505 would make the 505 faster still. I know the 710 has to push more pixels out, but that's part of the trade off, so I just thought I'd throw that in there. Switching between apps isn't any scientific way of testing the speed, but my un-overclocked 505 could display a full screen full of data before the 710 could display on empty one. So...both are awesome devices though. No need to argue. Try using Benchmark 2.0 on your m505 to find the relative timing. I am getting 300% using Afterburner 3.0z on my N710c and am happy with its speed. What MHz do you run it at on the 710? Or rather, what is the fastest it can sustain? Hmmmm... Interesting comment. The speed between switching apps. 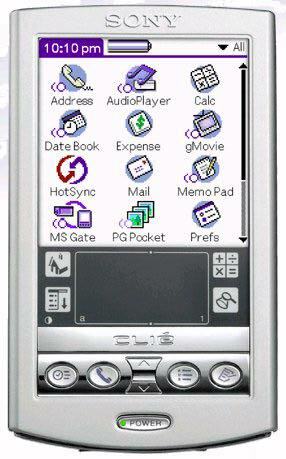 Sounds like you should get an iPAQ, the speed is much much much faster and the screen is much much better than m505. BTW, I have owned 710C since it's very early debut in US, I can't say there is speed problem between switching the apps. The photo is indeed slow, but the end results are excellent. I tried a demo 610c sent to Rush Pres. here is Chicago (trying to sell to nurses and Doctors here) and it is faster then my 710c is. That may be due to Palm OS 4.0 on the 610c; supposedly 4.0 contains faster database access routines and possibly some other speed increases over OS 3.5. Yeah, M505 and n610c are running OS 4.0. Try comparing FPS of two identical comps, but one running Win95 and one WinXp. Besides, is 3/10 of a second that long? Back in my day, it took 20 minutes to boot to MS Word! I could be wrong about the future of medical applications tending to be developed for the more robust (& less reliable?) Pocket PC operating system. I think the strongest expression of this point of view that I've heard was the current article by the Edward M. Zabrek, MD, the medical editor for Pocket PC Magazine. I would very much appreciate any comments that could address the in-depth review of medical applications that he has published. Palm is the standard here at Rush Pres. in Chicago. There updates being done in the "High Traffic" rooms to add IR ports to retreve info from a database server. Helps for billing and retreving info for out of state doctor recommendations. The software Palm is growing as well with vendors making software that reads from MS and SD cards and the small form factor is a big plus (no sleds to add for more memory) and the ease of use. The number of different devices that work alike is helping people chose the device thats right for them as well.